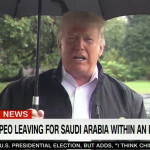 CNN reported Monday afternoon that Saudi Arabia are preparing a report that admits journalist Jamal Khashoggi was killed in an interrogation gone wrong. CNN, citing two sources, cautioned that the report was still in a preliminary phase. A new ad directed by Richard Linklater, the Hollywood director behind “Boyhood” and “Dazed and Confused,” calls out Ted Cruz for his preference for White Castle hamburgers. President Trump brushed aside results of a DNA test that shows evidence of Sen. Elizabeth Warren’s (D-MA) Native American ancestry.